Despite the disconcerting fact that the HULK does in fact look like a juiced Shrek, this is not as bad a film as its detractors would have us believe. With the masterful Ang Lee in the director’s chair, the blame for this production’s lack of luster must surely be placed on the shoulders of others. Even though the principals are not altogether acquainted with mediocrity – the phonetic Eric Bana (as Dr. Bruce Banner, the scientist bombarded with gamma rays who morphs into our beloved green muscle-blob) and the sensual Jennifer Connelly – their performances here are quite semi-conscious. …And we all know what happens when Bruce Banner gets enraged: his body turns green and his pants turn purple and very, very elastic. Even his socks cannot withstand the Hulk’s growth, snapping into shreds in homeopathic fury; pan up and sho ’nuff: purple pants tighter than the Beatles trousers. Speaking of straining threads, Lou Ferrigno (TV’s INCREDIBLE HULK) appears in a cameo, as a security guard in a shirt 5 sizes too small, walking beside none other than Stan Lee (the Hulk’s co-creator), playing a security chief. Josh Lucas skulks about the mid-ground as a Bad Guy. As with Spiderman’s new filmic incarnation, that which caused the Hulk’s condition has been updated from “radiation” to “genetic engineering gone awry.” In the 50’s and 60’s the big thunder was “radiation” – practically everything, when exposed to Big Bad Radiation turned into something which either wanted to kill people or save people (rats, men, plants, insects – nothing and no one was spared being exposed to Radiation to drive some puny plot down B-Movie Lane) – and ever so gradually, movies of our modern era have all come to rely on another repetitive plot device – Big Bold Genetics – only doing so because, as with Radiation, First World Science once again believes it has identified one of the seminal forces of nature. We believe ourselves truly to be scientific colossi – yet FRIENDS closed out ten seasons on network television recently to grandiose acclaim. Don’t make him angry at Donkey. You wouldn’t like him when he’s angry at Donkey. Despite the derision aimed at the Hulk’s CGI image, let’s face it, people of Earth – this is as good as it gets in 2003. The creation of this Hulk character is quite incredible! : a non-real, two-dimensional image that for all intents and purposes, is as real as it needs to be within its film medium; three-dimensionally at peace with its surroundings and the human characters it relates to. As “sophisticated” as we all think we are in this age of Gollum and Yoda Episode 2, I defy anyone to point out major discrepancies involving shadows, weight distribution, action arcs or moving musculature – this image interacts with smoke, water, trees, sand, exploding debris – it’s quite astounding to watch if you allow your suspension of disbelief to over-ride the elitist desire to prove how “smart” you are. 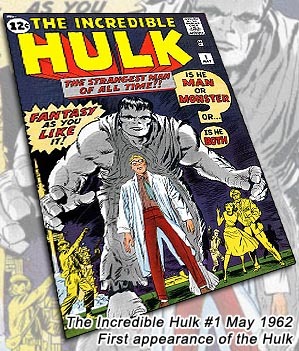 In truth, it’s more “realistic” watching the Hulk’s movements than any of the wire-fights in CROUCHING TIGER, CHARLIE’S ANGELS or DAREDEVIL, which are infuriating purely because the supposed “real-life” characters arc through the air “unrealistically” – i.e. they change direction, hover, or are simply edited sloppily, where we see the arc of their flight interrupted by the tug of the wires they so obviously are wearing. 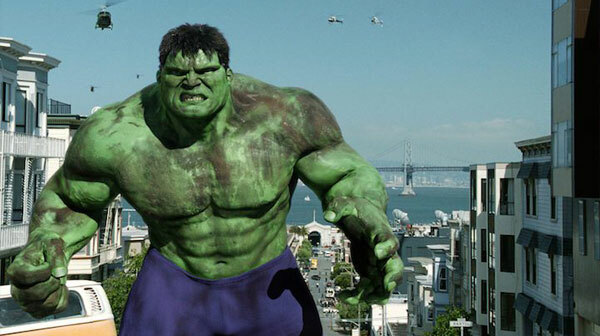 There is also much pathos in the Hulk’s facial features; more than could be summoned by his girl-toy Jennifer Connelly, whose doe-eyed pining couldn’t hold a candle to the Hulk’s Oscar-worthy palette of emotion – and neither could the Hulk’s human counterpart, puppet-faced Eric Bana. Instead of Nick Nolte (who plays Bana’s certifiably insane father more than satisfactorily), I was expecting GEPPETTO to appear, hoping that his son would become a Real Boy one day and able to move his facial muscles. Though they are merely ones and zeros, it is disconcerting to realize that the “cartoon” characters of this generation (the computer blips, such as Buzz Lightyear, Nemo, Gollum, Sulley & Monsters, Inc., Mr. Incredible, The Hulk, etc.) display a depth of acting talent that cannot be surpassed were they to be replaced by human thespians in those same roles. It is for Ang Lee to weep. It is for George Lucas to rejoice. Writers: Stan Lee, Jack Kirby, James Schamus, John Turman, Michael France. Starring: Eric Bana, Jennifer Connelly, Sam Elliott, Nick Nolte, Josh Lucas, Paul Kersey, Cara Buono, Kevin Rankin, Todd Tesen, Celia Weston, Mike Erwin, Lou Ferrigno.